This aromatic recipe is a nice change from traditional roasts. The creamy sauce uses no roux and is made right in the pot after the roast cooks. The savory sauce over the succulent roast is both elegant and appetizing without any of the fuss. 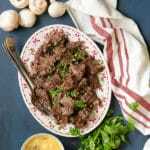 Press the SAUTE button and mushrooms, onion, and coconut oil to Instant Pot®. Stir fry for 5 minutes or until onions turn translucent. While stir-frying, mix dried minced onion, parsley, pepper, garlic, oregano, and salt in small bowl. Rub into chuck roast. Press the CANCEL button. Add Beef Broth and roast into pot. Place butter and cream cheese on top. Click lid closed. Select the MEAT button and press the ADJUST button to set heat to MORE. Set time to 90 minutes. When timer beeps allow a FULL NATURAL RELEASE to retain moisture in meat. When pressure valve drops, stir in heavy cream and remove roast carefully; it will be fall-apart tender. Press the SAUTE button and reduce the sauce in the Instant Pot for 10 minutes, stirring occaisionally. Press the CANCEL button and spoon over the roast when serving.